If you've read this previous post about princess stories, you'll know I'm not a big fan of the sickly sweet, one-dimensional, sit in a castle and look pretty kind of princess. But if you venture past your part of the forest surrounding the castle and push past the brambles and thorns, you'll find there are many fabulous princess stories to be found. 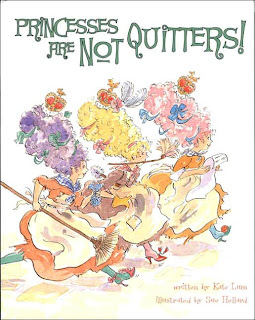 This one came from the library - "Princesses are not quitters!" by Kate Lum, illustrated by Sue Hellard. 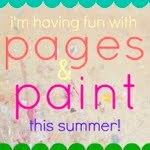 Well, I had to read it after glancing at the title! This is the story of three bored princesses, Princess Allie, Princess Mellie and Princess Libby, who decide that "Servants have all the fun!" "Now, Mrs Blue," said Allie to the housekeeper, "today we princesses are going to be servants. From now until midnight, we want to be treated just like servants." As you can imagine, the princesses are very tired. 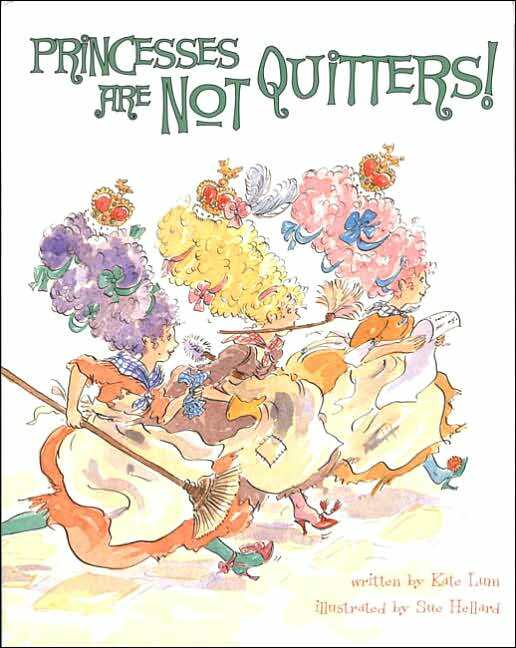 But they didn't want anyone to say that princesses are quitters so they kept on working. My favourite illustration is the kitchen page. Compare the servants' cupboard on the left to the cupboard for the princesses on the right! The moral of the story? You guessed it - the princesses feel proud of their efforts despite their aching bodies. Princess Allie declared: "There will now be new rules for servants in this land. Things cannot go on as they are!" The servants now must sleep in, rest, sit in the garden for an hour and eat whenever they're hungry. Imagine an organisation where the three bosses are willing to do the work of the lowest paid employee, write a manifesto to ensure all employees have holidays, start work at 9am and rest whenever they need! Maybe every small girl with either corporate or regal aspirations should read this book - wouldn't you like Princess Allie, Mellie or Libby as your CEO?